A bag that is as fun on the inside as the outside. Burnt orange suede Lazaro with brown leather trim and a turquiose blue interior. The mirror is attached so your look remains… well maybe you look a mess, but you’ll know. I found this at goodwill and couldn’t resist the modern design. If you like it too, email me at 50favbags@gmail.com and request bag 11. 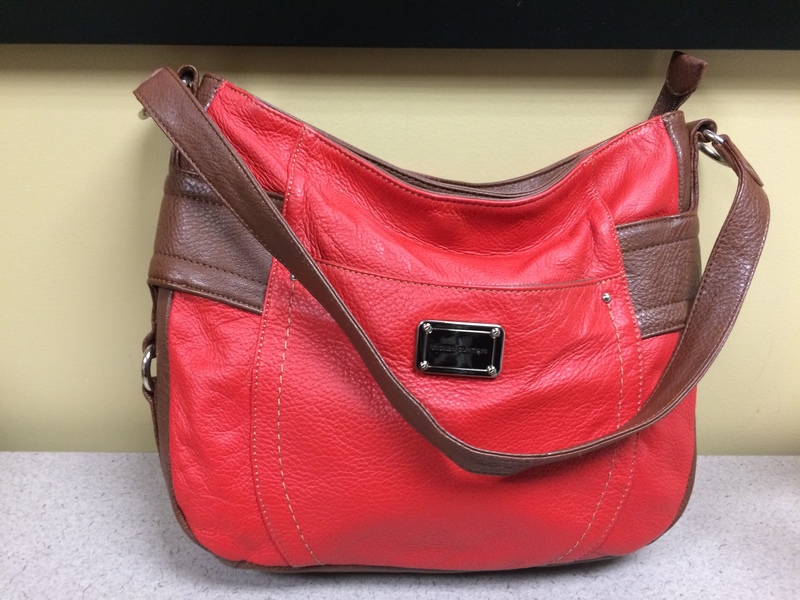 This entry was posted in 2019 Lent Bag Giveaway, thrifting and tagged hobo, Lazaro, Lent, orange, suede, turquoise interior on March 18, 2019 by miriamgmck. Another rainy day calls for a bright orange bag. I got this leather slouchy hobo from Latico at TJ Maxx a couple of years ago when orange was the color of the moment. It offers that pop of color when you want to wear blue or other neutrals – although I don’t ever wear it with just black. It was perfect today with my favorite Calvin Klein blouse and black and white checked pants. Yes, i wore two patterns and a bright orange bag today. And it was amazing. This entry was posted in tj maxx and tagged Handbags and Purses, Latico, Leather, orange, rain on April 24, 2018 by miriamgmck. I like big bags and I cannot lie. I also like the ikat pattern. While I really like this bag, it’s available to a new home. Snaps on sides give it a smaller profile. Perfect for daily life or vacation. Vegan trim. Email 50favbags@gmail.com if you like this one. This entry was posted in 2018 Lent bag giveaway, thrifting and tagged giveaway, goodwill, ikat, orange, thrift store, thrifting, tote on February 19, 2018 by miriamgmck. When you get to know and like purses as much as I do, you get to know brands. While a name brand doesn’t necessarily mean better quality, in the bag world that’s often exactly what it means. So when I’m shopping for bags at the thrift store, there’s a certain technique that I deploy to find the gold amongst the rubble. One day at my favorite Goodwill boutique, I was scanning the racks when I saw this bag. Bright, pebbled leather, structured hobo, silver hardware – I snatched it so fast from the rack I would have injured anyone unfortunate enough to be nearby. Stone Mountain is a brand I grew up associating with quality. I still use a green Stone Mountain that I bought around 13 years ago; I wrote about it here. If you like this reddish-orangish and brown bag, email me at 50favbags@gmail.com. This entry was posted in 2015 Lent bag giveaway and tagged brown, giveaway, goodwill, Handbags and Purses, orange, pebbled leather on March 3, 2015 by miriamgmck.